The oldest Volga German settlement in Oregon was initially located in the town of Albina which was platted in 1873 and later became part of Northeast Portland. Locals sometimes used the tongue-in-cheek names of Rooshian Town or Little Russia to describe the settlement. The intersection of Vancouver Avenue and Russell Street in the Albina area of Portland, Oregon (1909). Source: Oregon Historical Society. After first settling in the Midwest in 1875, the first Volga Germans migrated to Portland from Kansas in 1881, followed by a second group from Nebraska in 1882. Some of these families stayed in Portland and others went to Walla Walla and settled in the Palouse region of Washington State. 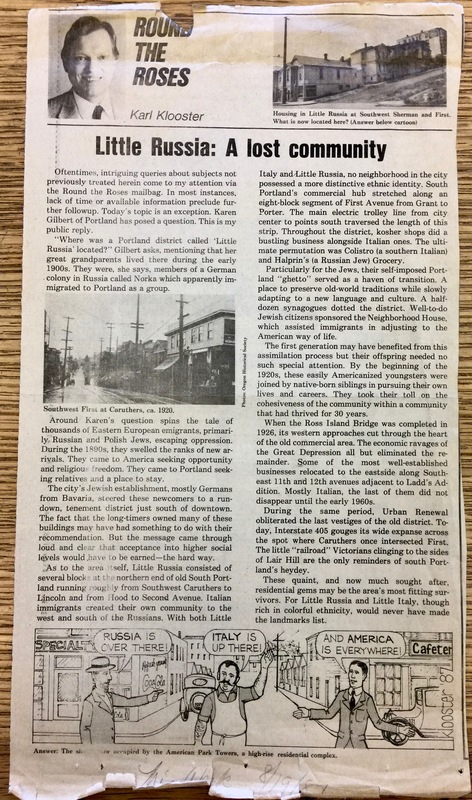 The earliest Portland settlement consisted of about 20 families and was concentrated between the area bounded by the current streets of NE Morris Street on the north, NE Tillamook Street on the south, NE 7th Avenue on the east and NE Martin Luther King Blvd. (formerly Union Ave.) on the west. This area was part of the original town of Albina that was laid out in 1873 by developers with railroad interests. It is not surprising that the early arrivals in Portland had help and encouragement from the railroad to settle in Albina and work in the rail yard and adjacent docks. In the first decade of settlement, a small number of families lived west of NE MLK Blvd. and several single men lived in the Brendles Addition near the rail yard. Some reportedly lived in houseboats along the Willamette River. A second group of about 15 families arrived in Albina in 1890. This group was primarily from the colony of Norka, Russia and they initially settled on land leased from the J.B. Montgomery Estate in lower Albina along the Willamette River (see this area on the map below). ​George Repp’s parents, Mr. and Mrs. Conrad Repp, had left Norka for Sutton, Nebraska in May 1886 when George was three months old. Their oldest daughter Pauline was born in Sutton on July 4, 1889. In the spring of 1890 the family moved to Portland, and it was here that two other children, Adam and Lena were born. After their arrival in Portland, Mr. and Mrs. Repp, in company with about 15 other families, leased some land from the Montgomery Estate and built their first homes at the foot of Russell Street directly along the waterfront. Here they continued to live until the spring of 1894, when the Willamette River overflowed and carried many of their homes down the river. This entire group of Volga Germans then moved to the district around Union Avenue where the earliest settlers who had come in the 1880's had already made their homes. 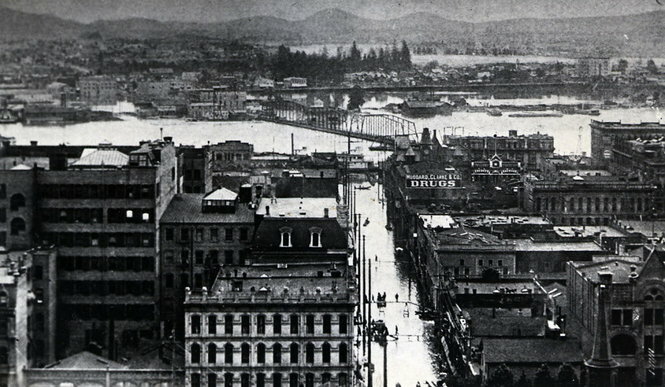 View of Lower Albina in late June 1894. Source: Portland Archives, image A2004-002.698. The 1891 Albina City Directory lists about 80 Volga German heads of household. The majority of these early pioneers lived in close proximity to each other in an area bounded by NE Graham St. on the north (formerly San Antonio St. and later Sellwood), NE 7th on the east, NE Thompson on the south (formerly Eugene St.) and NE MLK (formerly Union Ave. and known earlier as Margareta Ave.) to the west. Map of Portland, Oregon dated 1902, published by The Title Guarantee & Trust Co. and compiled by Huber and Maxwell, Civil Engineers. 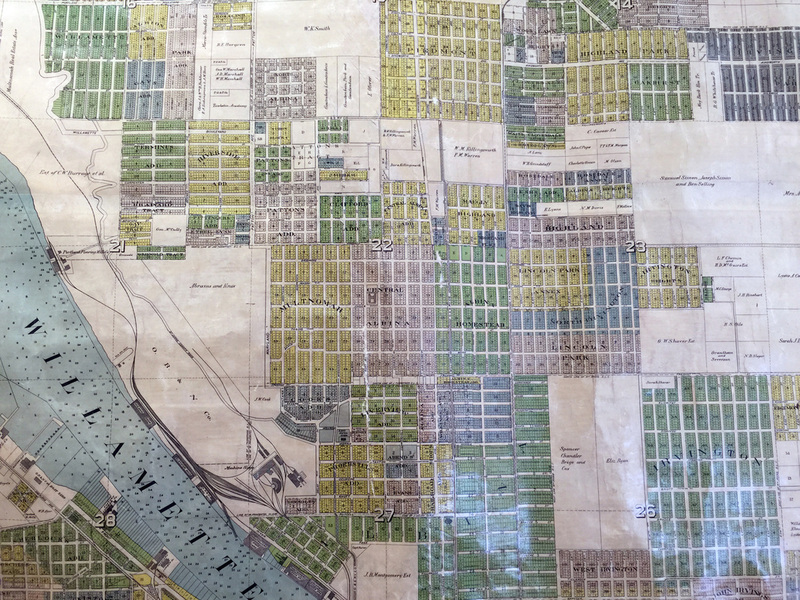 This map is displayed in the offices of Oregon Blueprint and the image is used with their permission. 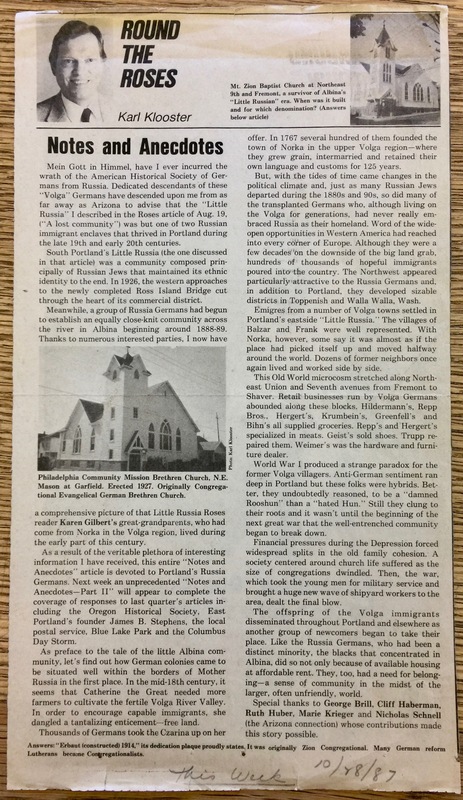 The first Volga German church was organized in 1892 adjacent to the settlement area of these early pioneers. It was named the First German Congregational Ebenezer Church and was led by Rev. Johannes Koch. A church building was constructed at NE 7th and Stanton. At the time, the church was located at the northeastern corner of the primary Volga German settlement and was within easy walking distance for the congregation. As the population grew and spread out further from the early settlement, more churches were established by members of the Volga German community. 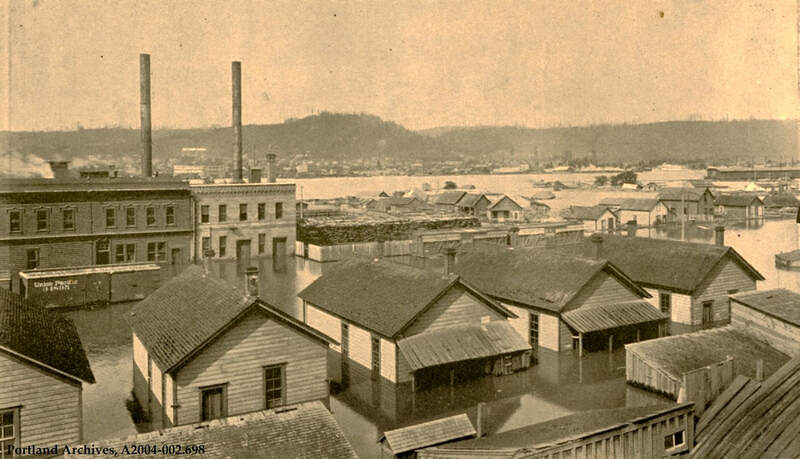 View from inundated downtown Portland to the east during the 1894 Willamette River Flood. Source: unknown. By the 1920's, the highest concentration of this growing ethnic group lived in the Albina Homestead and Lincoln Park additions. The area was bounded by Alberta Street on the North, 15th Street on the East, Knott and Russell Streets on the South, and Mississippi and Albina Avenues on the West. The area was home for most families until well into the 1940's. Many of the churches and businesses in this neighborhood were founded or owned by Volga German families. Most employers were also located in the immediate vicinity. 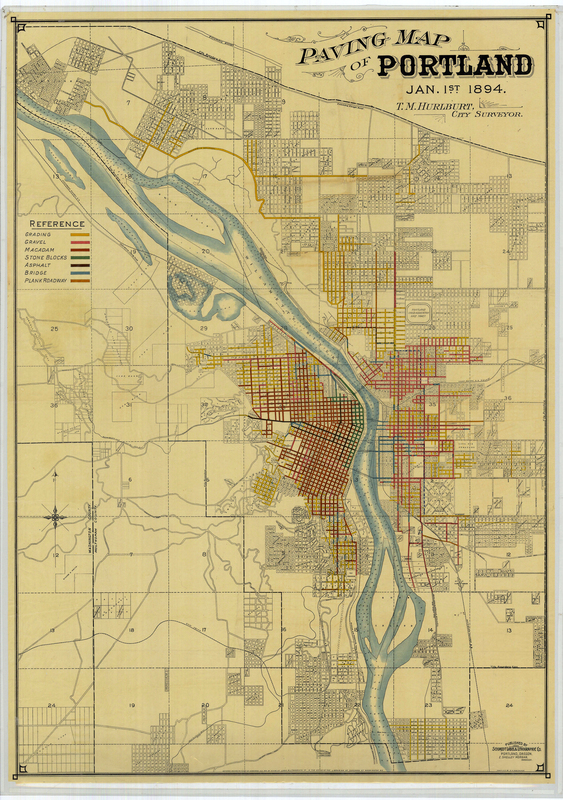 Paving Map of Portland in January of 1894 shows most of the Volga German settlement (blocks 22 and 23) does not have graded, graveled or paved roads at this time. Source: Vintage Portland website. At the time of the 1920 U.S. Census, the Volga German settlement in Portland numbered about 500 families. Given that families were often large (8 to 10 people) this represented a significant segment of the population in the Albina area. Williams Avenue was once the most fashionable street of Albina and the equivalent of today's shopping mall for the Volga Germans. At that time the road was planked from Russell to Alberta. Later a sandstone brick was put down when the ferry landing was put in at Alberta. Early settlers told stories about how they would zigzag the horse's back and forth across the steep hill near the Willamette River. Union Avenue (now Martin Luther King Boulevard) later became the heart of the Albina business district and was home to many Volga German businesses. The Egyptian Theater on NE Union Avenue near Brazee. Source: Oregon Historical Society. Before the large chain stores moved into the neighborhood, families patronized local businesses such as Repp Brothers, Hildermann's, Krombein's, Bihn's, Hergert's, Grenfell's grocery and meat markets, Geist Dry Goods and Shoe Store, Trupp Shoe Repair, and Weimer's Hardware and Furniture Store. Other stores were sprinkled throughout the neighborhood such as Danewolf's on NE 13th and Failing and Lehl and Popp on NE 10th and Failing who supplied groceries to the local residents. Store representatives contacted housewives at their homes or orders were phoned for delivery. Pad and pencil recorded each item and clerks retrieved the articles for the customer. After cows and chickens were no longer allowed within the city limits, milk trucks delivered milk to doorsteps. In the early days, children delivered milk in gallon buckets and quart jars to relatives and neighbors. 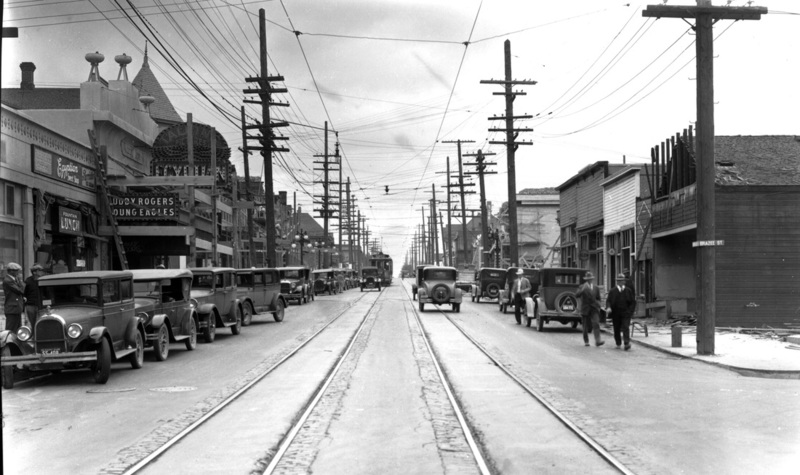 Lower Albina, along Russell Street, was a rough area. Some thirty saloon's spread out from the top of the ferry slip to the corner of Russell and Union Avenue. As late as 1929, Albina was connected to west Portland via ferry service. 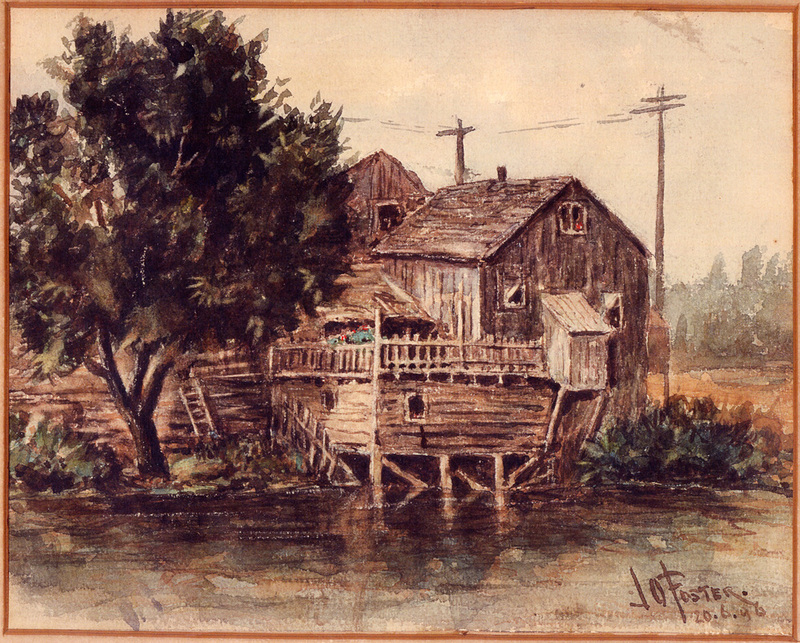 Painting by Portland artist J O Foster of a house near the Albina Ferry landing in 1896. According to the Portland Art Museum, Foster was an early Oregon artist who specialized in cityscapes. He exhibited in the Oregon Industrial Fairs of 1893 and 1895 and with the Portland Sketch Club. Haynes, Emma S. My Mother's People. Unpublished manuscript, 1959. Print. Sallet, Richard. Russian-German Settlements in the United States. Fargo: North Dakota Institute for Regional Studies, 1974. p. 48. Print.